One of the video game genres to make it big in esports over the recent years is the MOBA genre aka Multiplayer Online Battle Arena. Arguably, two of the biggest games in esports currently belong to this genre, and they are Dota 2 and League of Legends. Dota 2 is easily one of the biggest games in the esports scene right now. 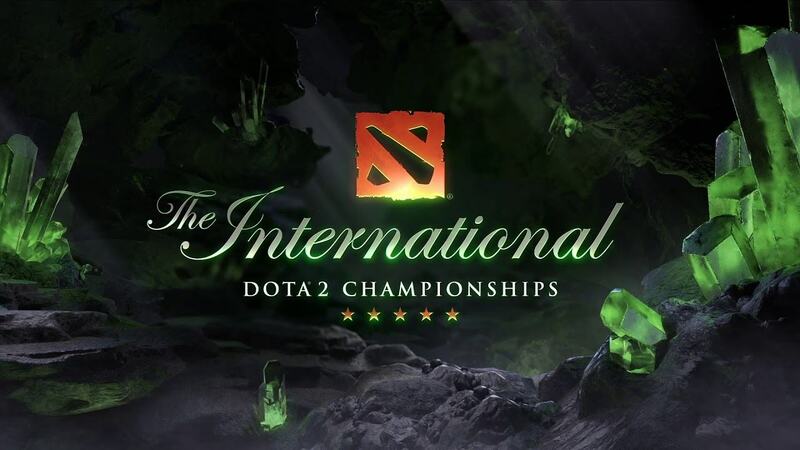 The biggest Dota 2 tournament, called TI or ‘The International', saw a prize pool of over $25 million last year, and viewership of over 15 million across the globe. It is an ever-changing and evolving game that has been around for years. Before there was Dota 2, we had Dota, which was just a custom map in Blizzard's Warcraft 3 RTS or Real-Time Strategy game. 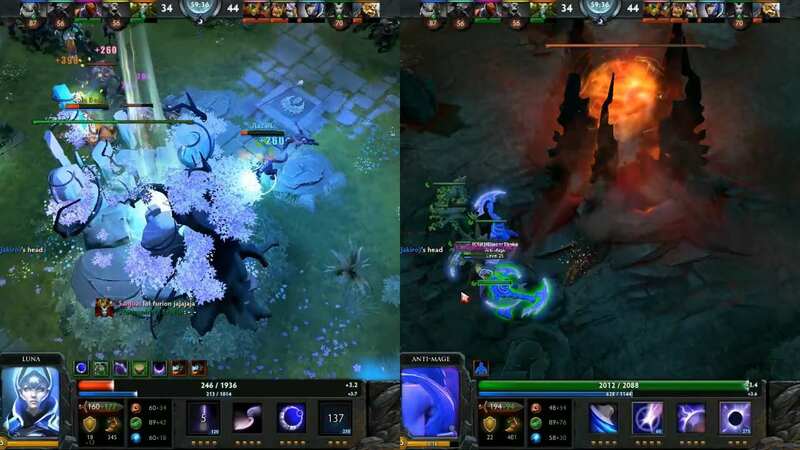 Dota is the game that popularised the MOBA genre and brought it to the forefront. Understanding MOBA games can be quite difficult and intimidating at first. For this article, we'll be taking a look at Dota 2 and everything you'll need to know to comfortably watch and follow what's happening in a professional Dota 2 match. Before we get started, don't worry too much, even though the game is constantly changing and has its complications, picking up the basics is pretty easy. Understanding the intricacies of all 100+ heroes may be a stretch, but getting a grasp of what's going on in the game is comparatively easier. As a plus, you've got casters and post-game analysts to slow things down for you during and after the games and explain things through. Let's begin. Dota 2 is an objective-based game. You've got two teams of five players, each controlling a single hero. The goal is to destroy the enemy ‘Ancient’ (hence, Defense of the Ancients). The Ancient is the huge glowing structure in the middle of each team's base, these bases are found at the bottom-left and top-right corners of the map traditionally. To win, you have to breakthrough enemy defenses to destroy their Ancient while protecting your own. That's Dota at its core. Pretty simple, right? Dire ancient on left, Radiant on right. Image: NoobFromUA. Now, in order to break through enemy defenses, players need to level up their heroes and accumulate gold. The gold is used to buy items which further power up their heroes. Leveling up and purchasing certain items also grants heroes with new abilities/powers which they can use to further their advantage. Heroes usually have four abilities or powers of their own, with one unlocking at level 1 and more unlocking as they level up. The ultimate ability, or fourth ability, comes into play at level 6. As the name suggests, these are powerful abilities and if used well, can turn the tide of battle. Every ability has a different ‘cooldown’ period after which the ability will be available to use again. This means you won’t be able to spam your abilities continuously against your enemies. Furthermore, there are certain items in the game, such as the Scythe of Vyse for example, which allows you to activate it and turn an enemy hero into a chicken. The team that’s able to do this more efficiently and quickly is usually the one that ends up winning. The main way in which players acquire gold and XP (experience, which is required to level up your hero) is by killing ‘creeps’. Creeps are AI-controlled minions that are always running from their own base towards the enemy base along the three lanes (more about lanes in the next section). Both team's creeps usually meet at some point in the lane and proceed to clobber each other to death. Here's where the player comes in. The player has to 'last hit' the creeps, or land the killing blow in order to get gold. If the creep dies to another creep, no gold is yielded. There are also neutral (not belonging to either team) creeps in the jungle, indicated by various dots on the map that can be killed for gold, or in gaming terms 'farmed' for gold. Killing an enemy hero also yields gold and XP, more so than creeps. However, since they’re controlled by real players, it’s harder to pull off. 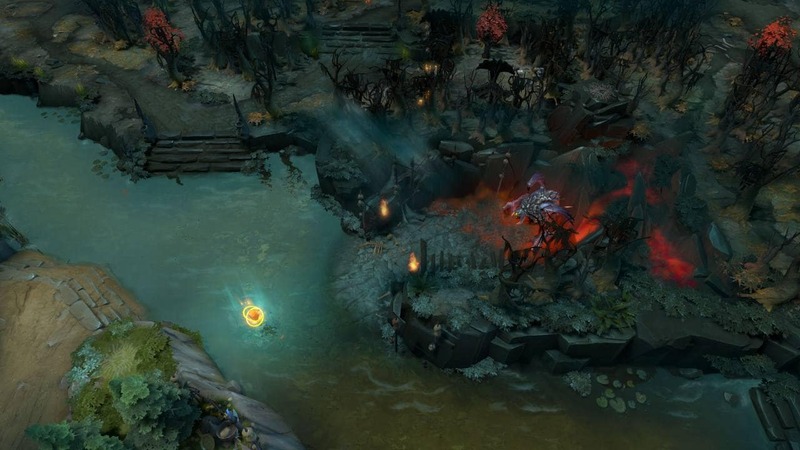 Dota 2's map is an iconic one that has seen few changes over recent years. 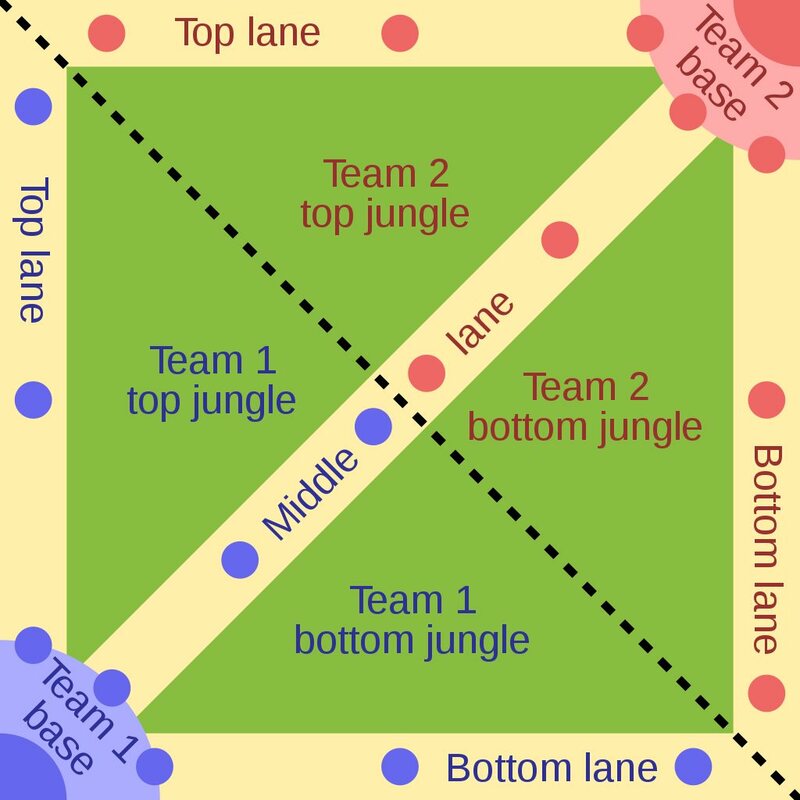 The map has three lanes, which at this point is synonymous with the MOBA genre. All three of the lanes are connected together by smaller paths which cut through what is called the 'jungle' in the game. This is where those neutral creeps we spoke of earlier reside. Then there's a river which cuts diagonally across the map, from the top-left to the bottom-right. The river also acts as the split between the two sides, with the top-right side with the sinister looking structures and dead trees being the 'Dire' side and bottom left-side with the green and vibrant structures being the 'Radiant' side. To win, you have to push your way down one (or ideally all three) of the lanes towards the enemy base. In addition to creeps which are constantly spawning at either base and running down every lane, each lane is also defended by a series of towers or turrets for either team, which you need to destroy in order to reach the enemy base. You can't skip these towers; you have to destroy them in order to push further. As for the lanes themselves, the middle lane is called, well, the ‘mid lane’. 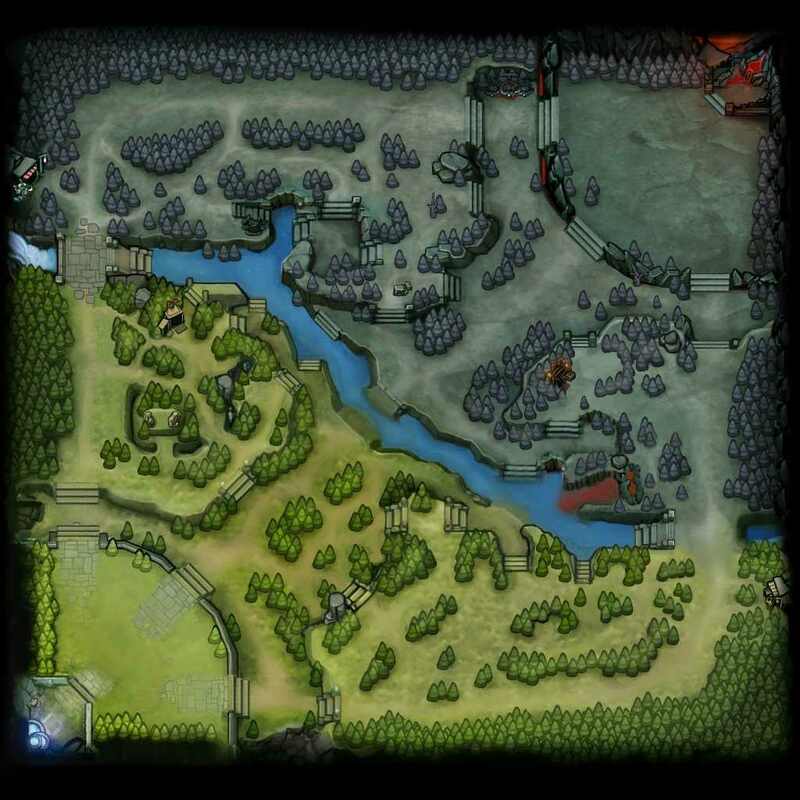 The one that runs along the top-left edge of the map is the ‘top lane’ and the one that runs along the bottom-right edge is the bot lane’. Lanes in Dota 2. Image: Raizin. Now, when we look at the base itself, the important structures we need to consider are the barracks, the towers and of course, the Ancients. Each lane has a set of two barracks and a tower protecting them. The barracks are referred to as ‘Rax’. The Ancient itself has two high-level towers protecting it. Dota 2 lane creeps. Image: Gamepedia. Your barracks are where your creeps spawn, and destroying the enemy barracks can be a huge advantage. While destroying the barracks doesn't stop enemy creeps from spawning, it does turn your creeps into 'mega creeps', which makes them much beefier and they hit harder. Essentially, their stats are increased. It is very possible to be overwhelmed by mega creeps if you're not careful. Next, we look into the jungle. The jungle is peppered with creep camps that will ‘aggro’ (immediately attack) anyone that comes too close to them or attacks them. They're a good source of XP and gold and respawn at timed intervals. Knowing these timings leads to efficient farming of these camps. Additionally, the jungle has two ancient creep camps as well, which are harder to kill but give much more gold and XP when killed. Finally, you have Roshan, who can be found in his pit, called the 'Rosh pit'. He's incredibly hard to kill and takes much longer to respawn. However, killing him results in him dropping an item called the Aegis of Immortal, which is a one-time use item that allows whoever is holding it to come back to life after a few seconds, effectively giving them two lives in a fight. 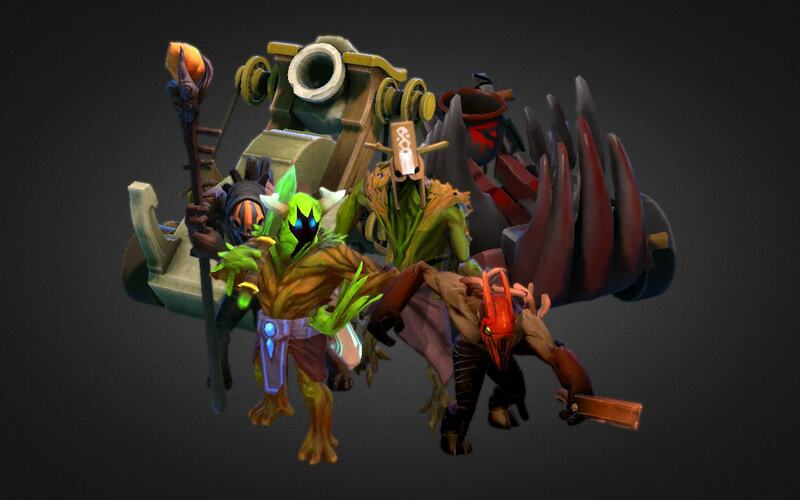 Rosh put and Roshan in Dota 2. Image: Dota 2. In pro play, Roshan is highly contested, naturally, as having such an item on your strongest member can greatly help with that final push that may be needed to win the game. There are five players on each team, and all five will try to fill a certain role. In Dota, roles are often referred to by position numbers, which indicate the priority for gold and XP. Position 1 is the ‘carry’. Carries traditionally start off weak but with help from the team, accumulate the most gold and XP. As the game progresses they become the strongest hero on the team and the main damage dealers. Position 2 is the ‘midlaner’. Mid lane is the shortest, which means creeps reach the fastest, this, in turn, means midlaners level up the fastest and get an early-game advantage. This role is often taken by damage dealers with utility abilities, such as stuns and slows. Position 3 is the ‘offlaner’, which is arguably the hardest role. They're in a lane on their own against both the enemy carry and the support. They have to get gold and XP despite usually having difficult match-ups. For this role, you usually have 'tanks' or very durable heroes who are good at 'initiating' or starting fights for their team. Position 4 is a roaming support of sorts, who can fill many roles, from helping out the offlaner to surprise attacks in the mid lane (or any lane for that matter) and also farming the jungle for XP and gold. Position 5 is the babysitting support. Their job is to protect the carry in the lane and keep them safe while they farm. 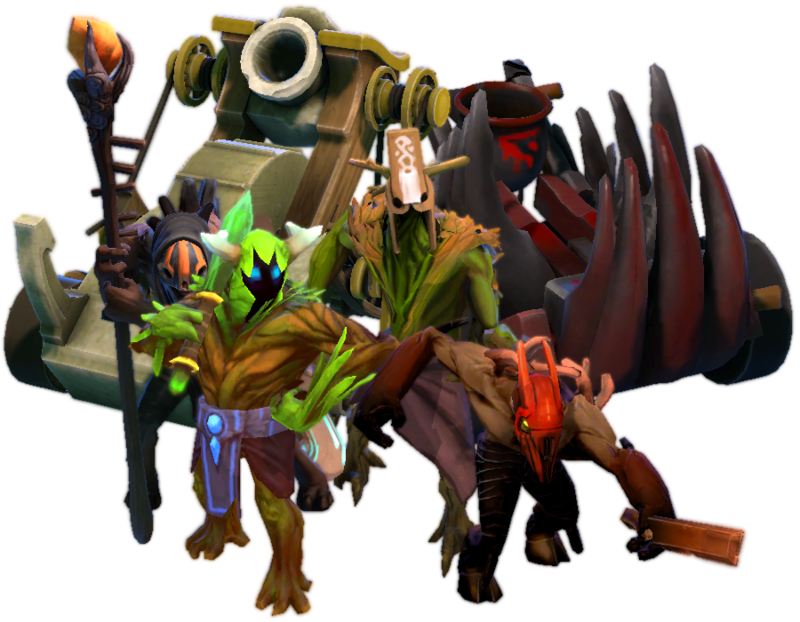 Since they get the least gold and XP in the game and can't afford expensive items, they're the ones who usually buy the cheaper support items such as couriers (small controllable minions that transport items from the shop to players) and wards (trinkets that provide vision in an area when placed). However, they're as important as any other position, since a good support can help the carry excel. Apart from these popular roles, nothing is set in stone. The game's always changing and so can the roles and positions. If you've played Dota 2 yourself casually, then you're probably more familiar with ‘All Pick’, which lets you pick whatever hero you want. In pro play, however, you have ‘Captains Mode’. Captains mode is the standard format for tournament and professional games. 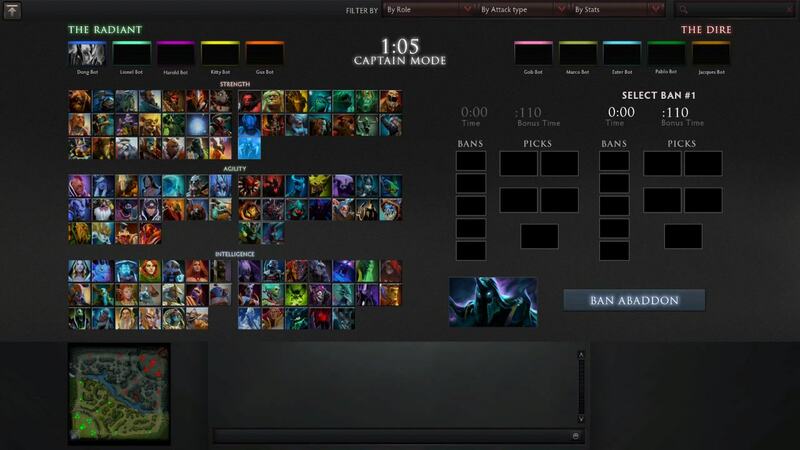 Captains Mode is also one of the ranked game modes on the Dota 2 client, meaning you can play this mode on your own PC as well. This allows one player on each team to pick and ban heroes, meaning you select heroes for your own side while removing the heroes that you don't want your opponent to pick for themselves. The order usually goes with both teams alternatively banning and picking two heroes each, then they repeat the same for the next two, and finally each side bans and picks their fifth hero, resulting in a total of 10 bans. Drafting in Dota 2. Image: Dotabuff. Games can often be won or lost in the drafts. It isn't unusual to see teams target-ban a certain player if they know they’re good at it or ban a hero they know that could counter what they plan to play. In pro play, games are often won in the best of three or best of five matches, giving each team ample opportunity to mount a comeback. There's a lot of strategy involved and a lot of in-depth knowledge about heroes is required, but you don't have to worry. There's always analysts in professional game broadcasts breaking down the draft phase for you so you don't feel too lost. MMR or matchmaking rating is the term used for a number that defines how you’re matched with opponents. It’s usually a hidden number that the game uses to identify your skill level so that you aren’t matched against opponents who are too weak or too strong. In the context of watching pro play, MMR isn't that important. It only matters when you play matchmaking games on the client, not in tournaments. If you’re wondering how teams make it into the tournaments, usually, as is the case with most tournaments, there are qualifiers held around the world. TI is the concluding tournament of the Dota Pro Circuit. 2018 was the first year that a point-based system based on performances in official Major and Minor tournaments was used to determine the teams that would be invited to TI. Eight teams were invited based on their performances, and ten teams qualified through the circuit. There's a lot that goes on during a match, thankfully, pro games usually keep the camera focused on where the action is most likely going to take place. While watching, you'll often see things like level and gold advantage come up, which indicate how well a team is doing. You will also hear of the team 'score', which is basically a number indicating the number of kills and towers a team has taken. Naturally, a higher score means that the team has nabbed more kills and objectives, so you can safely bet that the team with the higher score has a gold advantage. However, this doesn’t mean that they’re sure to win. Team score in Dota 2. Team fights can be confusing to follow with the myriad of abilities flying around and all the colours, but after a few games in you'll be able to start making out what exactly is happening. One of the key things to pay attention to here are heroes’ 'ultimate' abilities, which are usually their strongest abilities and have the longest cooldowns. You can be sure that most team fights revolve around these ability cooldowns. Of course, the best way to get a grasp of the game might just be to give it a try yourself! It's free after all, and even a few games might help you get a better understanding of what's happening in a pro game. 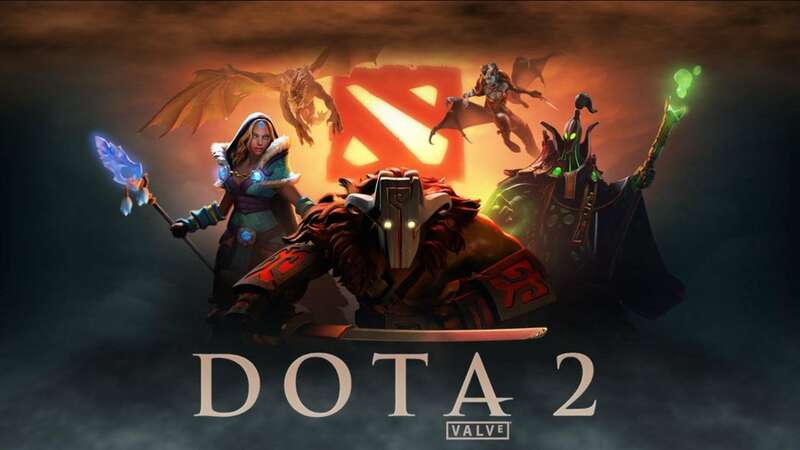 Easily, the biggest Dota 2 tournament every year is The International, that's been hosted by Valve every year since 2011. Every year the prize pool has only gone higher, crossing a whopping $25 million last year. The tournament usually takes place around early August. Other popular recurring Dota 2 tournaments include ESL One and DreamLeague, and there are several more minor championships to keep an eye on too. The International Dota 2 Champions. 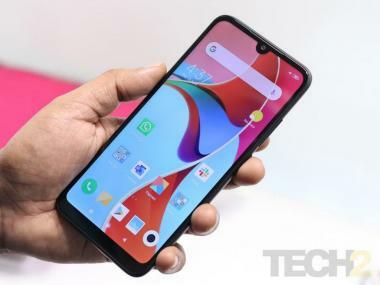 Within India itself, you have the ESL India Premiership which is arguably the biggest and most popular, followed by Dew Arena, ROG Onslaught, and the Taiwan Excellence Gaming Cup that have been annual recurrences. Like with just about every competitive game, the best place to watch TI is probably Twitch. Valve will also usually stream every match on their own website. The website also provides a bunch of information on the side along with each stream which might be helpful for newer watchers. If you happen to have purchased ‘The International Battle Pass’ within the Dota 2 client, you've not only contributed to the prize pool, but you've also got yourself a tick to watching the tournament in-game, which will let you control how you want to view the game. You'll still get the same casting as if you were watching the game on Twitch or Dota 2’s website. Currently, some of the best teams in the world include Team Secret, Virtus Pro, Vici Gaming, Evil Geniuses and PSG.LGD (yes that's PSG as in Paris Saint-Germain, the football club). Team Liquid, Fnatic, and Natus Vincere or Na'Vi for short are also still around and kicking in the pro scene. In the Indian Dota 2 pro scene, the teams to look out for are Entity Gaming, Signify and ROG Titans. Some of the best players of Dota 2 in the world currently include Kuroky, N0tail, Miracle-, MinDContRol and Matumbaman. In India, the top players are BlizzarD, Swifty, NO_Chanc3, Crowley and Negi.